365-Days Satisfaction Guarantee. If you are unsatisfied with this dash cam, simply contact us to return it for a full refund or ask for a new replacement. Loop recording overwrites the oldest footage with the newest upon filling a card to capacity without manual intervention. Never leak seconds, you will not worry about the SD card will fill up. Use the included suction mount to securely fasten the Dash Camera to your car's windshield or dashboard in seconds. Plug in the included car charger and connect the Dash Camera via the Mini USB cable to power on and instantly start capturing footage. Includes a dual-port car charger to power the camera and an additional USB device like your phone or tablet. 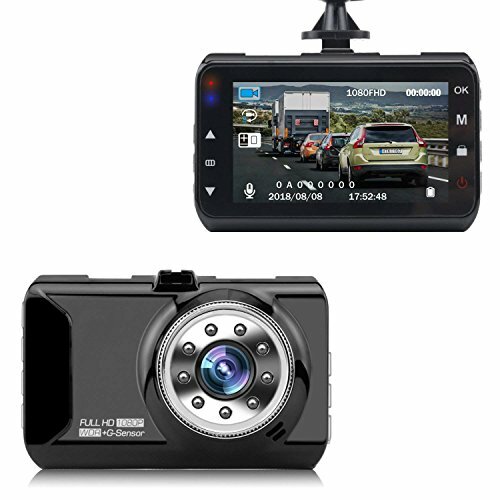 This dash cam supports TF (micro SD) cards up to 32G(Not included). To ensure data is processed at high speed, please use a Name Brand memory card. - For the first time using please format the SD card. Capture Every Detail: Advanced CMOS sensor enables dash camera recording at 30fps. Wide Dynamic Range Technology auto-adjusts for light conditions to deliver perfectly exposed full HD 1080p footage. Superior Night Vision: 9 unique infrared LED fill lights allow the dash cam to perform optimally in low light situations. Clearly capture license plates- no matter day or night. Extreme Temperature Resistance: Operating temperature from -10°(F) to 170°(F), the dashboard camera is ready to record in any climate. Features a 185°(F) storage temperature, allowing you to leave it mounted without fear of overheating. Emergency Recording: Enabled by Gravity sensor technology, the car camera automatically captures unexpected driving incidents and protects the recordings. 3.0" TFT LCD Widescreen: offers a broader view which enables you to monitor the whole road while driving. With humanized design buttons and easily recognizable icons, it makes for an intuitive experience. If you have any questions about this product by coolsun, contact us by completing and submitting the form below. If you are looking for a specif part number, please include it with your message.